So now all the B.Com 1st year students can check their results online. 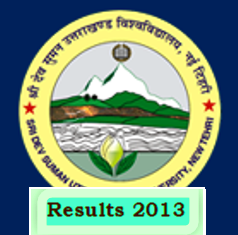 Therefore below I am giving a link to get your B.Com 1st year results of Sridev Suman University. So just click the given link and then enter your roll number on it and click to submit, then you will get your result online. I wish you all the best for your results and your brighter future. Click here to get your B.Com 1st year results 2013. For more updates of another results and exams stay connected with our website or you may also easily follow our updates by email subscription. ba.1st year ka result kab ayega ?